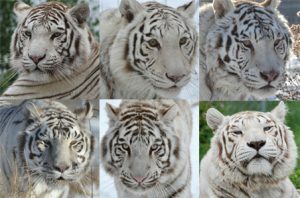 Home » If white tigers are rare, why are there so many at The Wildcat Sanctuary? If you’ve been to a fair or local festival, chances are you’ve probably seen or heard this from exhibitors. Whether they’re baby white tiger cubs for you to hold and play with. Whether they’re full-grown tigers they offer you the opportunity to take a photo with – make no mistake, it’s a for-profit business. And if white tigers really are so rare, why has the The Wildcat Sanctuary been contacted to rescue so many of them? Because, the truth is, they aren’t rare any more. Years ago, a breeder might sell a white tiger for tens of thousands of dollars. Now, since the market’s been glutted with them, they’re sold for a fraction of that. But, it’s still a lucrative business. HOW ARE WHITE TIGERS CREATED? White tigers are simply Bengal tigers with white fur. They’re not a separate subspecies of tiger. They’re the result of a mutant gene that’s been artificially selected through massive inbreeding to essentially produce man-made tigers for entertainment. You’ll still find famous magicians and entertainers trying to promote them as a rare separate species. Only a minority of the general public knows the truth about this business of breeding for birth defects. So it’s easy to manipulate many who’ll pay to see them. DO WE NEED TO CONSERVE WHITE TIGERS IN THE WILD? And let’s dispel the myth that, if you pay to see or play with one, this is somehow helping conserve white tigers in the wild. White tigers are simply a novelty with no conservation value at all. They’re very rare in the wild for a reason, possibly as few as 1 in 10,000 wild tiger births. They’re a bad genetic mutation that Mother Nature eliminates. Odds are against them being able to survive infancy to adulthood in order to reproduce and pass on this mutant gene. White is, quite obviously, terrible camouflage for a predator that has to hunt to survive. It’s estimated there are perhaps less than 5,000 orange tigers left in the wild. There are currently no known white tigers alive in the wild. But that doesn’t mean the genes aren’t carried by orange tigers living in captivity who are exploited for carrying that mutation. HOW DOES PAYING TO SEE ONE HURT OTHER TIGERS? 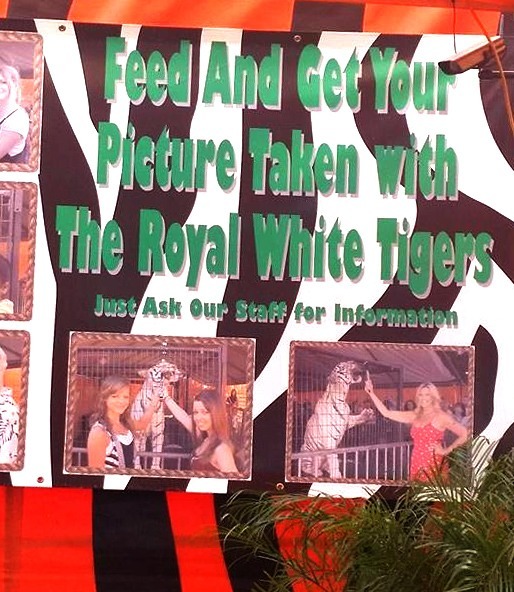 When you pay to see a white tiger, you encourage the irresponsible inbreeding needed to supply this abusive industry. The neonatal mortality rate exceeds 80% for white tigers! To put that in perspective, it’s typically only 30% for orange colored tigers in AZA zoos. What does that tell us? That a lot of tigers must be bred in order to get that one “perfect” white tiger everyone wants to see. And a lot of surplus orange tigers and imperfect white tigers born in the process are unwanted and disposed of any way possible. This white tiger mania is also a big reason why we have more orange tigers in cages in the US today than tigers left roaming in the wild. DO WHITE TIGERS HAVE OTHER HEALTH ISSUES? What happens to the captive-born white tigers who survive but also carry, in addition to the white gene mutation, numerous life-altering complications thought to accompany this gene? These tigers tend to have difficulty processing visual stimulation, problems with the way their brains control their eyes, trouble understanding spatial relationships when young since so many are cross-eyed in one or both eyes. Kidney problems, cleft palates, club feet, spinal deformities, and shortened tendons are also common disorders that may afflict them. DO AZA ZOOS STILL BREED WHITE TIGERS? In 2011, the Association of Zoos and Aquariums (AZA) took a huge step in banning member zoos from breeding white tigers, lions, and cheetahs. But, it doesn’t stop these zoos, roadside attractions, and traveling exhibits from displaying them. They’re also not prohibited from obtaining them from other sources. So, it’s up to all of us to stop supporting the cruelty involved in displaying this mythical, non-existent species. The white tigers being dumped after they’re no longer earning their keep in the exhibition world didn’t ask to be in this situation. Share these 8 fast facts about white tigers with others whenever you see a story posted on social media and in news stories, too. Click HERE for an example of how to educate reporters.